I'm looking at this old military pension file index. Jeptha Tallant is listed under the heading "Old War" -- which war is it referring to? I believe he was born in 1811, so the Revolutionary War doesn't fit. Also, what does the "Rej." heading mean, and the "Invalid" column, and why does it seem like his file is connected with the name Eleazer Bulkley? Finally, should I expect to find any other records somewhere? I've had good luck digging up treasures in some pension applications. 2017 update: Subscribers to fold3 can view the index card -- it is from NARA A1158, Pensions indexed by number for Army or Navy service in the Civil War and later, 1860-1934. For images of the blank cards, see Card Records in Use in the Bureau of Pensions, 1916 (U.S. Government Printing Office, 1916). For another timeline see the table American Involvement in Wars from Colonial Times to the Present on the American History section of About.com. I went to Fold3 to puzzle out what the source of this image might be -- as ColeValleyGirl says, it's important to have the context in order to analyze this record. This index complements the Civil War and Later Veterans Pension Index (T289), as well as other pension indexes and files, in assisting researchers in locating pension file numbers and names of Army and Navy personnel, as well as widows' pensions (marked with a w) on the card. It is a superb cross-referencing tool when deciphering illegible or missing numbers within other indexes. Both certificate numbers and application numbers are included. The cards give the name of the veteran or dependant who had the number as an application number or as a certificate number. Each number could be used four times for four different people. (emphasis mine) For application or original numbers, the card also shows the certificate number. See what I meant about being confusing? The number appears in the upper left hand corner. Along the left side of the card, you will see “Invalid” and “Dependent,” and then “Orig” (meaning application) and “Ctf” (meaning certificate). Since we’re looking for Lazarus White’s certificate number, look under Invalid, then Ctf. Look to the right, and you will see Lazarus White’s name and unit. So now we know that the number 920,628 is correct. Unfortunately the author of the post does not show a portion of a card which has the same legend as the "Old War" section, so there are no clues to what the "Rej." stands for, nor is there any clue as to what period "Old War" means. Now I wondered: if the records of the War Department were reorganized at some point, could "Old War" refer to a filesystem and not necessarily a specific war? Could it be a catch-all term for all the wars prior to 1812? The position on the card suggests that (at least to me). This microfilm publication reproduces a card index to the "Old Wars" series of pension files, 1815-1926. These files relate chiefly to claims based on death or disability incurred in service in the Regular Army, Navy, or Marine Corps between the end of the Revolutionary War in 1783 and the outbreak of the Civil War in 1861. The pension files in the National Archives are divided into these major series: Revolutionary War, Old Wars, War of 1812, Indian Wars, Mexican War, and Civil War and later. The records in each series are arranged alphabetically by name of veteran, except those in the Civil War and later series, which are arranged numerically by application, certificate, or file number. All series of pension application files have alphabetical name indexes. For the Civil War and later pensions, consult National Archives Microfilm Publication T288, General Index to Pension Files, 1861–1934, which is arranged alphabetically by the individual's last name. The index cards include the individual's unit(s), making it easier to decipher individuals with the same name. Once you find the application number or pension certificate number, you can request to view the pension file. Pension files (including application files) often contain valuable personal information on soldiers, sailors, and marines not found in other records. For a listing of microfilm publications to other pension indexes and pension files, consult the National Archives' Microfilm Resources for Research: A Comprehensive Catalog (2000). For more information on pension records, consult chapter seven of the Guide to Genealogical Research in the National Archives (2000). If you can find the file referred to with the number 18336 then perhaps it will become more evident exactly which war is being referred to, what the "Rej." means, and Jeptha Tallant's connection (if any) with the associated person Eleazer Bulkley. Eleazer Buckley, "United States Revolutionary War Pension and Bounty Land Warrant Applications"
Affiliate Identifier: 12029578 "United States Revolutionary War Pension and Bounty Land Warrant Applications," index, FamilySearch (https://familysearch.org/pal:/MM9.1.1/N9HR-5MG : accessed 01 Feb 2014), Eleazer Buckley, . This is clearly from a different period of service and a different area of the country, so it seems to me that the only association between these individuals is the coincidence of their file numbers. WorldCat has listings for where the Guide to Genealogical Research in the National Archives (2000) can be found in libraries, including a copy to view online at HathiTrust Digital Library -- see page 173, section 7.2.2 for the explanatory matter on "Old Wars" and the sections following for more records pertaining to the individual conflicts. A search for "Old War" in the Guide also results in a hit on page 375, in the List of Microfilm Publications cited, for T316: Old War Index to Pension Files, 1815-1926, RG 15. 765 rolls. from the references in the article immediately above: Card Records in Use in the Bureau of Pensions, 1916 (U.S. Government Printing Office, 1916) available at Google Books and the Internet Archive. ... the cards include several different wars -- Old War, War of 1812, Mexican War, Indian War, and Navy as well as Civil War army soldiers. (Old War refers to service in the Regular Army between the 1780s adn the Civil War.) This index can be useful if a published source connects a person with a common name to a pension file number without any military unit or other helpful identifying information. NARA's guide Microfilm Publications and Original Records Digitized by Our Digitization Partners is also useful for cross-checking which NARA microfilm publications are online and where. Different sites can have wildly different image quality, so it can help to check them all if the image you find at the first site is difficult to read. This (http://research.archives.gov/description/1105306) seems to indicate that the "Old Wars" were "between 1783 and 1861" including "War of 1812, Mexican War, Indian wars, and in a few cases, the Civil War". Another index card for Jeptha Tallant is viewable at: https://familysearch.org/pal:/MM9.3.1/TH-1961-25481-29785-31?cc=1979425&wc=MM1Q-V7W:n2078095668 but it gives little extra info other than a rank and unit, plus date of filing (1851, which might suggest the Mexican War). I would expect you could access the complete case file (if it still exists) via NARA. The "Invalid" column names the disabled or deceased individual in respect of whom the pension was applied for. I suspect Rej. means rejected. However, the card is so inconsistently completed that I wonder if the row and column headings have any relevance, or whether it's just two columns of names of pensioners made using a card intended for another purpose. It would help if you provided more information about the source. 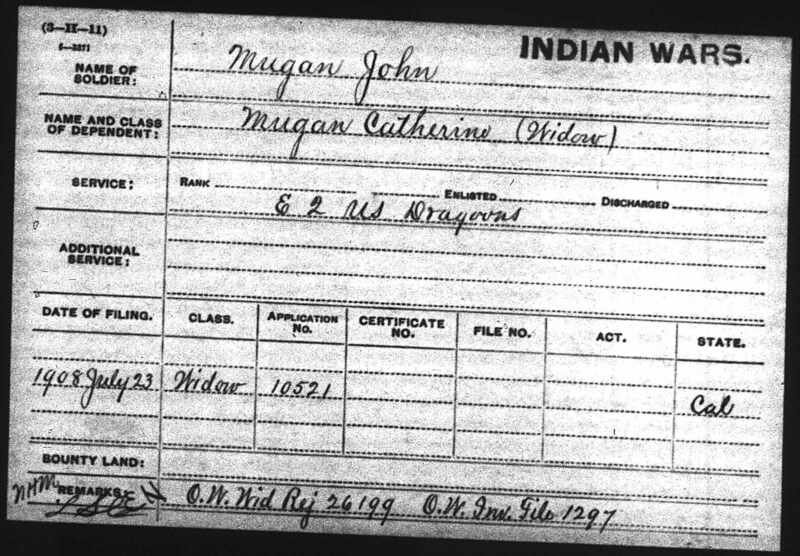 Here is an example of INDIAN WARS Pension filing by Widow of John Mugan. Here is the card for the second request for Catherine Mugan, widow of John Mugan. This card specifically states: 'OLD WAR'. 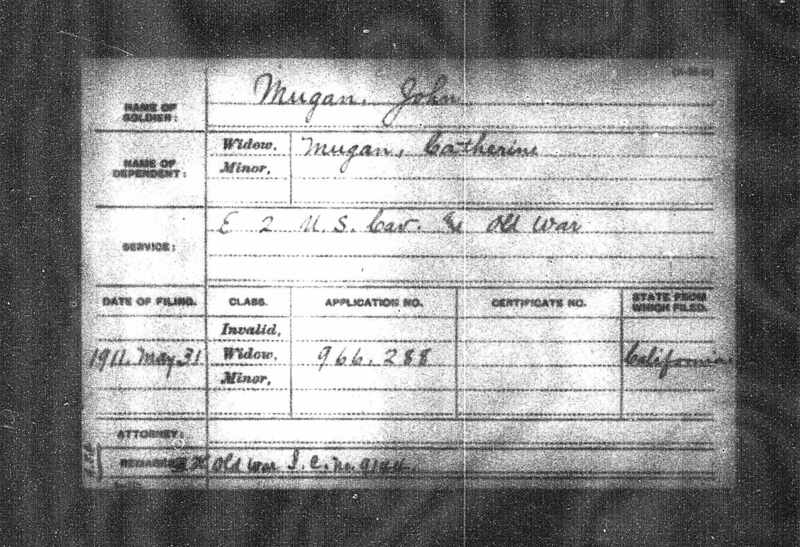 We know from the previous registration card that the OLD WAR which John Mugan participated in was INDIAN WARS. We can read further and find that he was involved with the 2nd U. S. Cavalry Dragoons. With further research we can find what the actual location of service was, i.e. where the 2nd Cavalry Dragoons fought/which battles they were involved in. I had a Great-Grandfather that was in the Old War and Indian Wars and want to understand what the information on the cards mean. Not the answer you're looking for? Browse other questions tagged united-states military-records pension-records or ask your own question. What does the “Copy of Record No” field on a naturalization petition index card mean? Locating 18th/19th century grave in Massachusetts? How do I find if my father was in the Royal Navy or Merchant Navy in World War 2? How can I ensure that I am making a reasonably exhaustive search? What uniform is this (US Army branch, where and when)? Civil War pension card listing alias and different wife? What does this Peninsular War medal roll say?